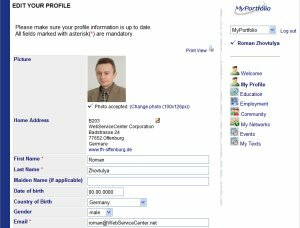 Uportal MyPortfolio provides an easy way to edit personal profile (resume) data online. Education, experience, skills, contacts, etc are inputted using simple web forms. Later, this information is presented as a profile page, contact page or online resume. Uportal MyPortfolio is fully integrated into Uportal CMS module, so profile and resume data can be created and linked directly from a website.